Tiger shrimp marinated in sweet and savory Asian spices, encrusted in an almond batter. Deep Fry. 100 per case — 1.0 oz. A crispy blend of red & white quinoa, wild rice & amaranth encasing aromatic sausage, creamy mozzarella, and zesty tomato sauce. Spicy Andouille sausage, creamy cheeses, encrusted in an herbed panko bread crumb shell. Deep Fry. 200 per case, .75 oz. Tri-color cheese tortellini, marinated roasted tomato, Kalamata olives and Proscuitto ham on a 6" skewer. A thaw & serve hors d'oeuvre, but can be warmed for a bold flavor. Thaw & Serve. 100 per case, .75 oz. A refreshing skewer of Italian-flavored marinated artichoke, sun-dried tomato, mozzarella cheese, and olive. Thaw and serve. 200 per case - 1.0 oz. Handcrafted buttermilk biscuit, filled with gently folded eggs, Monterey Jack cheese, and applewood smoked bacon, folded in a crescent. Premium apricot jam is spread over imported French brie, providing a hint of sweetness with this mild yet flavorful cheese. The brie is encased with flaky puff pastry dough. Bake. 200 per case — 1.0 oz. Quartered artichoke heart is topped with rich and creamy Boursin cheese. 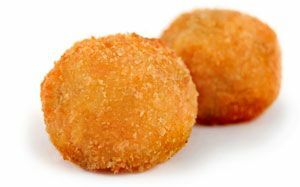 This delicious combination is coated in a light batter, then rolled in a mixture of bread crumbs and Parmesan cheese. Deep Fry. Creamy béchamel sauce, white meat chicken, Asiago cheese with roasted garlic and onion nestled in fillo. Fresh asparagus is layered with Asiago cheese and spices and gently rolled in fillo with a parmesan-panko crust. Bake. 200 per case, 1 oz. A smooth blend of avocado, tomato, onion, and Southwestern spices inside a crispy spring roll skin. Deep Fry. Mozzarella, cheddar and parmesan cheese inside a mini new potato skin and topped with bacon and chives. Bake. 200 per case, 1.0 oz. A tender strip of chicken breast, wrapped with a strip of lean bacon and spicy jalapeno cheese, held together with a toothpick skewer. Bake. 100 per case, 1.0 oz. Please note, this is a special order only and requires a 33 CASE MINIMUM. Premium, lean bacon envelops a tasty seasoned quail leg providing an elite gourmet treat for your guests. Bake. 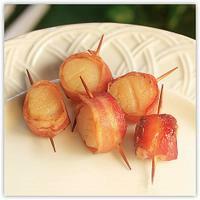 A plump white sea scallop wrapped in a strip of lean bacon and skewered on a tooth pick. Bake.